Whether it’s a wedding in Delhi or any place else, there are no compromises made in quality, excellence and exuberance. For couples who have no qualms of how much they spend to celebrate their big day, for those guilt-free and ready to splurge couples, locking in on any wedding venue in Delhi, especially Chattarpur, could be as easy as counting one-two-three. However, Chattarpur of all places in Delhi is filled with numerous lavish banquet halls and wedding venues that could easily confuse you. Our listing here will pretty much simplify your hunt and help you make an informed decision. We bring to you these popular banquet halls in Chattarpur, including other type of wedding venues like farmhouses and outdoor lawns that are most sought-after for a reason; read to discover. From small and close-knit pre-wedding festivities to large and shaandaar type wedding reception, whatever is your style of celebrating your union, Country Inn & Suites has got your covered. With multiple banquet halls and wedding lawn options at your disposal, this exquisite site at Chattarpur is all you need to host a luxurious wedding. Expert chefs lay a flavoursome spread of cuisines, while a professional décor team decks up the entire venue suited to your personal preference. Find photo gallery, pricing details and more helpful info here. Delhi wedding and extravagance go hand-in-hand. If you’re planning to host a larger than life wedding in Chattarpur, The Ocean Pearl Retreat offers the most lavish indoor and outdoor facilities to choose from. Each banquet hall interiors are designed to perfection, while their sprawling lawn areas set the right mood for outdoor weddings. With their in-house décor, catering and DJ team at your service, this all-encompassing venue is a total steal. Another most sought after wedding location in Chattarpur, Mapple Exotica is where most big fat Delhi weddings take place. 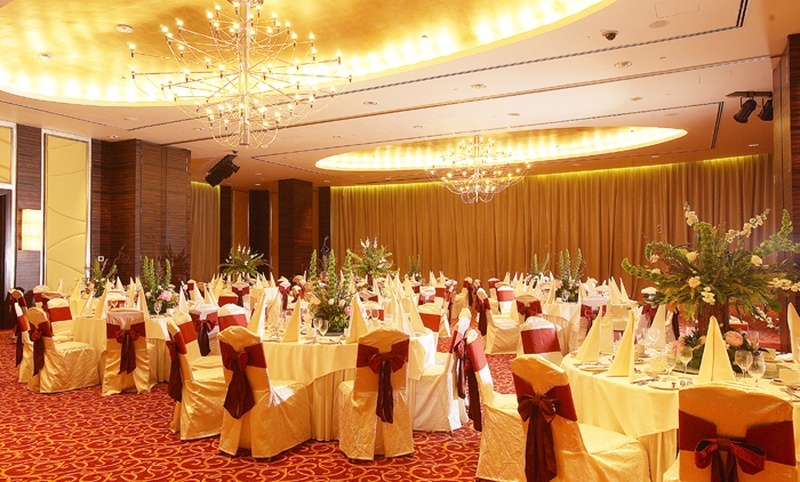 This mid-high banquet hall in Chattarpur falls nothing short in ensuring that your special day is super extravagant and gets all the attention to detail it deserves. With a large venue space spread over 8 acres and experienced staff that is at your service round the clock, you know you’re in for supreme luxury and comfort. At Brij Greens, outdoor weddings meet their ultimate lawn venue. Offering perfectly mowed lawns that can be combined with a hall should you need a partial indoor and outdoor wedding affair, Brij Greens know exactly how to help you throw a wedding reception of a lifetime. With in-house décor provided by well-known florist Ferns N Petals, could you ask for more? Central hub of hospitality and merriment, Shagun Farms is one of the biggest banquet halls in Chattarpur you can book to host a grand style wedding. Redefining royal and big fat Indian wedding, this location is ideal to host that Jodha-Akbar style wedding you’ve been day-dreaming of. You can choose from their 3 large well-manicured lawns, each better than the other in all aspects. Their décor services is powered by Ferns N Petals who ensure you receive customised sets, design and flower arrangements to the T.
Radiance Motel at Chattarpur offers 3 banquet halls each classily designed guaranteed you’ll be spoilt for choice. From intimate pre-wedding celebrations to elaborate wedding festivities, this hotel in Chattarpur ensures all your wedding requirements are met with excellence. Should you need a venue to host an extravagant celebration, Radiance Motel offers a well-manicured lawn at your disposal. With such an exquisite venue available on a budget, this venue is indeed a good deal. Centrally located amidst popular tourist attractions, Golden Tulip is the best location where you can host your grandeur wedding, whether or not you have outstation guests attending your special day. From stylishly designed banquet halls to plush green lawns and splendid terrace facilities, each and every spot available at this splendid hotel will certainly steal your heart. You can arrange for your own caterer, decorator and alcohol, foot tapping music guaranteed to drag the young and old to the dance floor will be organized by the venue. From hosting intimate pre-wedding celebrations in their banquet hall to grandiose wedding ceremony and reception in their lawn, Hotel Executive Club in Chattarpur makes for an ideal all-inclusive venue. The venue adds no royalty to any arrangements, including décor, catering, DJ and alcohol that you organize on your own. However, the venue leaves no stone unturned to satisfy your gastronomic cravings with their expert chefs preparing delectable traditional and international dishes. With creative decorators who have the knowledge of the venue’s layout, you can rest assured their décor will add subtle sparkle to your celebration. You can check out more such wedding venues in and around Delhi here.